For the video game, see PDC World Championship Darts. The PDC World Darts Championship, known for sponsorship purposes as the William Hill World Darts Championship, organised by the Professional Darts Corporation (PDC), is one of the two separate World Professional Darts Championships held annually in the sport of darts. The other is the BDO World Darts Championship organised by the British Darts Organisation (BDO). The PDC championship begins in December and ends in January and is held at Alexandra Palace in London. It is the highest profile of the PDC's tournaments, with the winner receiving the Sid Waddell Trophy, named in honour of the darts commentator Sid Waddell, who died in 2012. The PDC championship began in 1994 as the WDC World Darts Championship as one of the consequences of the split in darts, which saw the World Darts Council break away from the BDO. As a result of the settlement between the BDO and the WDC in 1997, the WDC became the PDC, and players are now free to choose which world championship to enter (but not both in the same year), as long as they meet certain eligibility criteria. The current PDC champion is Michael van Gerwen. With 14 wins from 25 appearances, Phil Taylor has dominated the competition, last winning it in 2013. Other than Taylor, there have been seven other champions. The other players to win it more than once are Michael van Gerwen (2014, 2017 & 2019), John Part (2003 & 2008), Adrian Lewis (2011 & 2012) and Gary Anderson (2015 & 2016) . The one-time winners are the inaugural champion Dennis Priestley, the Dutchman Raymond van Barneveld (2007), and Rob Cross (2018). In 1992, some high-profile players, including all previous winners of the BDO World Darts Championship still active in the game, formed the WDC (now PDC), and in 1994, held their first World Championship. Dennis Priestley won the inaugural competition. The players who broke away were taking a significant gamble - the tournament was broadcast on satellite television rather than terrestrial, and from 1994 to 2001, the prize fund for the players in the WDC/PDC World Championship was lower than the prize fund in the BDO version, although the 1997 PDC World Champion received £45,000 compared to that year's BDO World Champion receiving £38,000. In 2002, the PDC prize fund overtook that of the BDO for the first time, and the PDC event now boasts the largest prize fund of any darts competition. In 2010, the prize fund reached £1 million for the first time, with the World Champion collecting £200,000. The 2014 and 2015 PDC World Champions collected £250,000 for their respective wins. In 2018, the prize fund will be increased to £1.8 million, with the World Champion receiving £400,000. The PDC World Darts Championship has been held at Alexandra Palace in London since 2008, having previously been held at the Circus Tavern in Purfleet, Essex, from 1994 to 2007. Nine nine-darters have been thrown at the World Championship. The first one was in 2009. Since the breakaway of the PDC players, there has been much debate about the relative merits of the players within each organisation. The debate often focuses on the three-dart averages of players in matches. An average over 100 in a match in the PDC World Championship has since been achieved 195 times. This is compared to 21 times in the BDO World Championship, following the 2019 event. In 2010 Phil Taylor became the first player to average over 100 in all six rounds of the tournament. He repeated this feat (though lost the final) in 2015 and Michael van Gerwen achieved it in 2017 and 2019. An average of over 105 in a match in the PDC World Championship has been achieved 40 times. The highest match average ever in the BDO World Championship is 103.83 by Raymond van Barneveld in his quarter-final victory over John Walton in 2004. Most titles: 14, Phil Taylor. Taylor's two BDO titles take his total to 16, a record across both organisations. Most finals: 19, Phil Taylor, 1994–2007, 2009–2010, 2013, 2015 and 2018. Most match wins: 110, Phil Taylor, 1994-2018. Taylor has only lost 11 matches at the tournament and reached every final from 1994 until 2008, when he was beaten in the quarter-finals by Wayne Mardle. Longest unbeaten run: 44 matches, Phil Taylor, 1995–2003, between his defeats in the 1994 and 2003 finals. Most 180s in a tournament (total): 828 in 2018. This was the first tournament to feature a 96 player field. Most appearances: 25, Phil Taylor. Youngest player: Mitchell Clegg, 16 years and 37 days. Clegg qualified as a 15-year-old in 2007. He was younger than Michael van Gerwen, who set the BDO World Championship youngest player record a few weeks later. Youngest finalist: Kirk Shepherd, 21 years and 88 days In the 2008 final, Shepherd was two days younger than Jelle Klaasen, who won the BDO title in 2006. 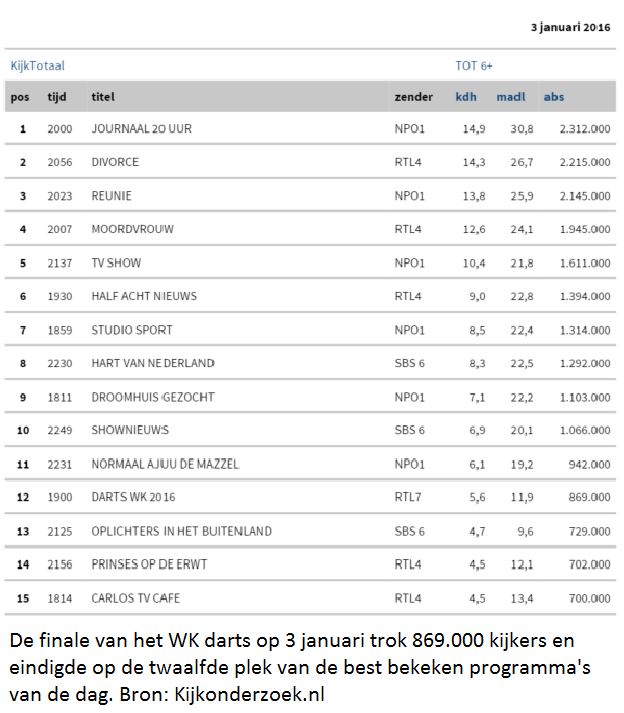 Record TV audience: 1,500,000 (2015 Final). The 2007 final was the first time that Sky Television achieved a viewing figure of over 1 million for a darts match. The 2013 final had a 1.2 million average, with 10 million viewers over the course of the tournament. Won both World Championships: Four players. Dennis Priestley was the first player to win both versions of the World Championship, winning the 1991 BDO Championship and the 1994 PDC Championship. Phil Taylor, John Part and Raymond van Barneveld have since matched the feat. Overseas World Champions: Three players. John Part was the first player from outside the UK to win the PDC World Championship with his 2003 title, followed by Raymond van Barneveld in 2007 and Michael van Gerwen in 2014. Part was also the first overseas player to win the BDO title, doing so in 1994. The stage at the 2009 World Championship. The PDC World Championship has been broadcast live and in its entirety by Sky Sports in the UK since its inception. Since 2009 the tournament has been shot in High Definition (HD). Their coverage is currently presented from a studio overlooking the interior of the Alexandra Palace venue. Dutch broadcaster SBS6, having covered the BDO World Darts Championship for many years, also covered the event until RTL7 took over broadcasting. Fox Sports (Australia), BBC America (USA), TSN (Canada), SuperSport (South Africa), Sky Sport (New Zealand), StarHub (Singapore), Ten Sports (India), CCTV (China), Showtime (Middle East), Ukraine TV, IKO (Poland), NOVA Sport (Czech Republic and Slovakia), Sport1 (Hungary), Meersat (Malaysia), 7TV (Russia), Measat (Indonesia), J Sports (Japan), DAZN (Italy), GOL TV (Spain) Eurosport (Romania) now also broadcast the event. The PDC world championship events are now broadcast on www.livepdc.tv which shows the events live, highlights and also classic matches. This website is a subscription only viewing and is limited to certain territorial restrictions. Following popular darts commentator Sid Waddell's death on 11 August 2012, the decision was made to rename the champion's trophy to the Sid Waddell trophy from the 2013 tournament onwards. ^ "PDC championship moves to London". BBC Sport. 2 April 2007. Retrieved 2 April 2007. ^ "2017 PDC World Championship Tournament averages". Darts Database. Retrieved 24 November 2018. ^ "2016 PDC World Championship tournament averages". Darts Database. Retrieved 24 November 2018. ^ a b "2010 PDC World Championship tournament averages". Retrieved 24 November 2018. ^ "2009 PDC World Championship tournament averages". Darts Database. Retrieved 24 November 2018. ^ "2018 PDC World Championship tournament averages". Darts Database. Retrieved 24 November 2018. ^ "2019 PDC World Championship tournament averages". Darts Database. Retrieved 16 January 2019. ^ "2011 PDC World Championship tournament averages". Darts Database. Retrieved 24 November 2018. ^ "2006 PDC World Championship tournament averages". Darts Database. Retrieved 24 November 2018. ^ "PDC WC Match wins page 1". Darts Database. Retrieved 14 January 2015. ^ "PDC WC match wins page 2". Darts Database. Retrieved 14 January 2015. ^ "PDC WC match wins page 3". Darts Database. Retrieved 14 January 2015. ^ . Retrieved on 2017-01-03. ^ Niemaier, Timo (3 January 2017). "Darts-WM: Neuer Quotenrekord für Sport1 zum Finale - DWDL.de". DWDL.de (in German). Retrieved 18 December 2017. ^ . Retrieved on 2017-12-16. ^ Sülter, Björn (4 January 2016). "SportCheck: Darts-Rekorde, Insel-Showdown & Schanzenfieber". Quotenmeter (in German). Retrieved 18 December 2017. ^ Kijkonderzoek. Retrieved on 2015-01-05. ^ BARB. BARB. Retrieved on 2013-08-13. ^ "World Darts Trophy Named After Waddell". Sky News. 13 August 2012. Retrieved 13 August 2013.